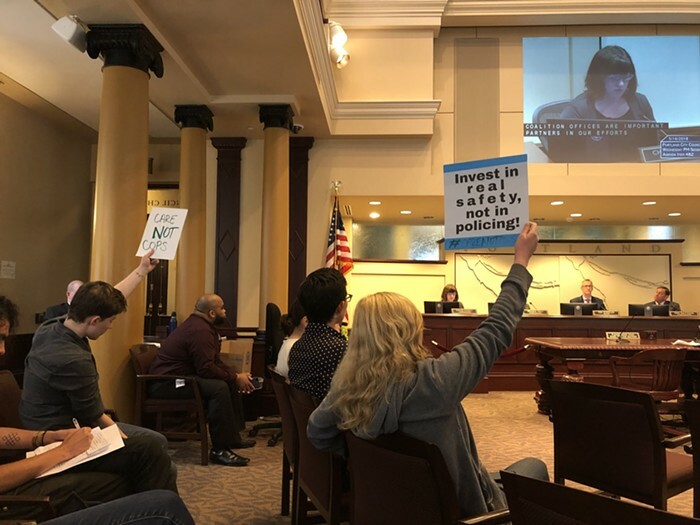 After months of contentious public debate and the constant reshuffling of bureau dollars, Portland City Council has unanimously voted to approve Mayor Ted Wheeler’s $5.11 billion city budget for 2018-2019. The approved budget remains largely unchanged from the draft Wheeler unveiled last week, which includes $31 million to fund the the Joint Office of Homeless Services, $2 million to strengthen renter protections, and nearly $6 million directed to hire 49 new sworn patrol officers. Commissioners did approve a number of new amendments to the budget, like Comissioner Dan Saltzman’s ask for $60,000 in one-time funds to cover legal services to immigrant survivors of domestic violence. Comissioner Chloe Eudaly tacked on an amendment mandating that the Portland Police Bureau (PPB) submit monthly reports on how much overtime pay is being spent on officers—and compile all this data online for further analysis. The vote was preceded by public testimony, featuring concerns we’ve heard raised throughout the budget cycle. A number of people representing Portland’s business community testified in support of the budget. Commissioner Amanda Fritz brought up another criticized piece of the budget—cutting YouthPass funding. Fritz said that YouthPass, a program that gives Portland Public School (PPS) students a free TriMet bus pass to school (in lieu of the district using their own yellow bus fleet), is meant to be funded by PPS, not the city. A number of meeting attendees gave that explanation a thumbs down. Nearly every commissioner noted the flaws in the city’s budget process, hinting at a future overhaul. No one disagreed. Next Why are for-profit US prisons subjecting detainees to forced labor?